With everything we have to do before our new baby arrives, keeping up with email has gotten to be quite a chore. In order to give myself a bit of a break, I've decided to stop selling patterns on Etsy. However, my Etsy shop will stay open for selling toys, kits, and other odds and ends when I have time to make them. It's always been a bit of a pain selling PDF patterns on Etsy, since I have to list them individually, email them on time (hoping that the email address provided actually works! ), and try to keep up with which ones are sold out. Instead, we'll be switching pattern sales to Ravelry (my website already has a handy link to my shop there). 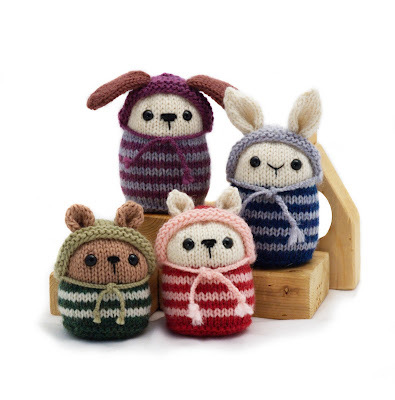 You get to see a lot more info about the patterns, a download link is emailed to you as soon as you pay, and you never have to worry about a pattern being sold out. Besides all this, Ravelry is a great resource and community, and well worth exploring if you love to knit and crochet. Because I won't be able to offer the discount pattern bundles there, we're going to reduce the price of most patterns (excluding a few which are already cheaper there). Unfortunately, we'll still have to sell our printed books through Lulu (the printer), since Ravelry only does PDF patterns. I know this might be a bit confusing, but the book pages on Ravelry do link to my Lulu shop, if you prefer a paper copy of the books. I plan to get this done tomorrow (Feb. 23), although it will take me an hour or so to change all the pattern prices on Ravelry. Hopefully this change won't be too confusing for you, and will free up my time to answer your questions and contribute to Ravelry discussions.